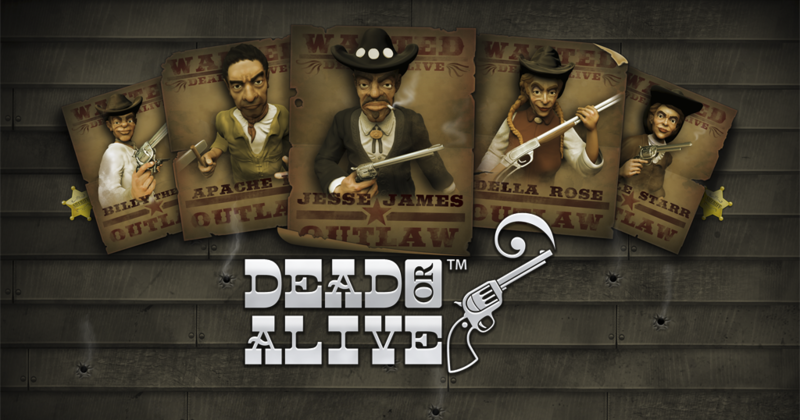 If you love westerns, you will enjoy Dead or Alive, Net Ent’s own attempt at creating a slot machine with this type of theme. The action which takes place in Dead or Alive appears to be fairly typical for a slot machine that chooses this kind of theme. As always, you have wood as the main material whenever buildings are shown, or even in the construction of the reels and their borders. There are images with six shooters, with whisky shots, cowboy hats and boots with spurs, among other things. It’s the typical Wild West look, one that is often chosen by developers. The top payouts have a potential of going up to $56,250 and you can get to them by wagering on the slot’s 9 lines. You shouldn’t have any issues with the design of the slot, at least if you enjoy this kind of theme and you’ve played similar titles in the past. I rather enjoyed what the slot offered in the way of symbols, including plenty of themed ones, along with playing cards with a black wood like material, which just as easily could be some sort of metal. The rest of the images include sheriff badges, drinks, boots, cowboy hats, Wanted posters and other related images. Though the slot has only 9 lines, you can select up to 4 coins for each one, for a total of 36 coins in the largest bet. The coin value is also a factor, and you can modify it in the range of $0.01 to $0.50. You end up with $2 line bets and $18 total bets, at most. The wild symbol has an image with a Wanted poster on it, and it serves as a regular symbol normally, but turns into a sticky wild if you’re in free spins mode. It can’t replace a scatter symbol, but get it as part of any other combo, and it will substitute for the symbols you’re missing. If it creates a combo of up to five wilds, it pays up to 1,500x. The Six Shooters will pay you as scatter symbols, and they can have incredible value. They pay as much as 2,500x the bet, and they do it by being present in as many as five locations during the same round. Have 3+ scatters, and you get 12 free spins as well, with 2x multipliers and with sticky wilds which remain in place until the games are over. It plays well enough, and even though I’m not happy about the use of only 9 lines, the slot is fun and it can pay big prizes.